How to respond if your child is bullied. Bullying: When a person or group uses power, whether physical, verbal or social, to harass or intimidate someone or a group with less power. Research has proven that ongoing bullying can lead to anxiety, depression, declining grades, drug use, risky sexual behavior, violence and suicide. Although there is no quick and easy way to stop bullying, getting your child to confide in you could be the first step in ending the bullying. Adhering to the suggestions below will help your child feel comfortable talking to you, allowing you to come up with strategies to end the bullying, enhance self-esteem and build resiliency. Children can often resolve their own challenges. Talking alleviates unpleasant emotions and makes it easier for your child to brainstorm ideas on how to solve a particular problem. Be an active listener. Convey empathy by rephrasing the information your child gives you and repeating the information back to your child in your own words. This indicates that you understand your child’s experience and feelings. Listen for the five Ws. Who was doing the bullying? One person or a few people? Is the bully someone your child doesn’t know? Or maybe the bullies are people your child interacts with at school. Who else is around when the bullying occurs? What type of bullying did your child experience— physical, verbal, relational or social aggression, or cyber-bullying? It might be a combination. Where does the bullying happen— in the neighborhood, on the school bus, in school, at the mall, online? When does it happen? Does the bullying usually occur at a certain time, like before, during or after school, or is it random? What about on weekends? Was the bullying a one-time incident or is it recurring? Why does your child think the bullying is happening? Because your child may be sensitive to being asked a lot of questions about bullying at one time, plan on having multiple conversations with more information being shared over the course of several talks. Make changes and build skills. Together, discuss ideas on how to safely and effectively stop the bullying. Role play different approaches and responses with your child to stop the bullying without getting into a physical or verbal fight. Also, brainstorm ways to increase friendships and develop physical and social skills that are appreciated by other children. Being bullied can create feelings of anger, frustration, sadness, depression and vengeance. Teach your children how to relieve these feelings without being violent to themselves or others. Ideas may include encouraging kids to talk with other adults and trusted friends, write in a journal, create art, do physical activities and practice deep breathing and other self-calming techniques. While bullying can occur anywhere, school is a common place for bullying to take place. If the bullying is happening at school, work with your child on solving the issue by including your child’s teacher, school counselor or advisor. Your child may be hesitant to let anyone outside the family know about the bullying or fear that the bullying will get worse if a teacher is involved. 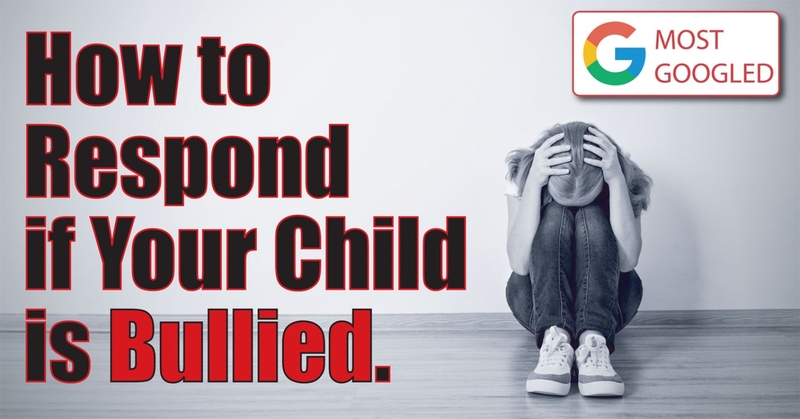 Remind your child that continued bullying is not an option and that you will work together to maintain safety in a way that is comfortable for your child. When meeting with school staff, heed the following suggestions. As bullying is an emotional issue, it’s imperative to be aware of your tone of voice. Use words and body language that convey a calm, professional demeanor. This encourages a productive conversation and successful outcome. Remember, you and school staff are on the same team. Contact your child’s classroom teacher or advisor. Inform the appropriate person who is in charge where the bullying is occurring what is going on with your child. Only go up the chain of command if you feel that a staff member is not effectively addressing your child’s physical and emotional safety. Generally the chain of command is as follows: teacher, counselor/advisor, dean/assistant principal, principal, assistant superintendent, superintendent, school or district board of education, state board of education. Present to the teacher relevant information about the bullying incidents and anti-bullying strategies already attempted. Be prepared with ideas for resolving the situation. Tell the school ahead of time to request that certain staff members attend the meeting. A good safety plan addresses which staff members are responsible for supervising your child, especially in problem areas such as hallways, on the playground and on the bus, and how staff should react if your child is bullied. The plan should also state how your child is expected to react if confronted by a bully. Practicing assertiveness skills and role playing ways to respond to the bully help build your child’s confidence and increase his effectiveness in responding to the bully. Involve your child with the plan. Make sure your child feels good about the plan and believes the plan has a realistic chance of working. Give your child a day or two to consider the pros and cons and become comfortable with the plan. Steve Breakstone and Michael Dreiblatt are the co-founders of Balance Educational Services and authors of the book How to Stop Bullying and Social Aggression – Elementary Grade Lessons and Activities to Teach Empathy, Friendship and Respect (Corwin Press). Contact them at info@balanceeducation.net or (802)362-5448.